At times it feels like the pedal is trying to do too much at once, similar to a multi effects pedal but FAR from it. The TC Electronics Flash X4 offers twelve different delay types and four preset positions. This includes the typical delay modes which are found on any digital delay pedal, in addition to several modes which will prove handy in certain situations. One feature that is fairly handy would be the the four preset slots. The slots are Tone-Print positions that allow for the creation of any preset from the Tone-Print Editor. With the editor you’ll be able to create and save delay tones on any of the provided three instant preset slots accessed by the foot switches. I really like the preset features because of the ease of use they provide when playing live. Instead of having to turn the top-left knob to access your Tone-Prints or to change between different delays types, you are able to easily access your favorite settings directly from the footswitches. 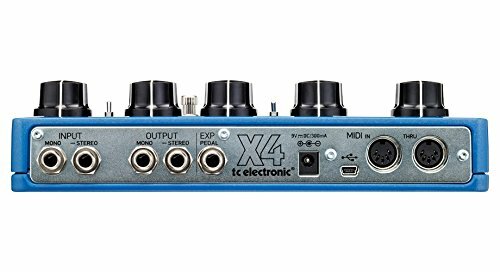 The Flashback X4 boasts an inbuilt looper as well as a delay. You can enable and disable the looper using a small toggle switch that you’ll find on the pedal’s face (its in between two knobs). Once enabled, four foot switches will control different looper functions. This looper has a maximum recording time of 40 seconds, which isn’t as long as some of the pedals in our best loop pedal article, but for a delay/loop combo its pretty alright. A dedicated knob will help you control the loop’s volume level. There is a separate level knob makes it quite a breeze to mix your levels correctly. Which can be helpful if you accidently record something too loud and need to adjust it. One of the top features is that you can use the looper while using the different delay types, something that’s uncommon with other pedals. The X4 Looper is hugely flexible and is among the best loopers we’ve seen integrated onto a delay pedal. On the back, you’ll find the input/output expression pedal input as well as the USB and MIDI options. The Expression Pedal feature might not be a big deal, but it’s nice to see that it’s present. The Flashback X4 features both MIDI In and Thru. Some artists will find that extra capability useful. 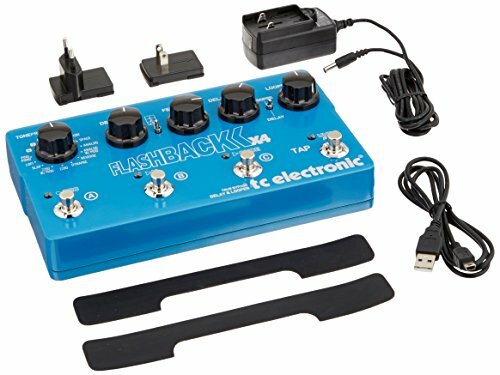 You can read the Flashback X4 manual for more information on features like the Expression Pedal or the MIDI. One thing I have started to gravitate away from are pedals that lack a dedicated tap tempo footswitch. The ability to quickly tap the tempo using your foot rather than turning a knob or pushing a button is a handy feature to say the least, and one that comes stock on the X4. Features like this are what make the X4 superior to the other smaller Flashback pedals TC Electronics offers. TC Electronic Tone-Print is an app and editor that allows you to customize presets and upload them onto your pedal. The X4 comes standard with presets from some famous guitarists. The smartphone app enables you to customize presets and load them wirelessly onto your pedal through your guitar pickups… pretty insane if you ask me! While there is an option to connect your X4 to your Mac or PS via USB, you can just use your smartphone to ‘beam’ your Tone-Prints onto your pedal. Considering that the app is entirely free, that is an impressive feature! The days where both digital and analog delay pedals sounded awful are far behind us. While there are some bad-sounding pedals out there, most delay pedals sound true to the signal. The X4, however, sounds fantastic. The analog-style delays sound authentic, giving a nice, warm feel. The Space delay creates a beautiful, rich atmospheric floor that you’ll build on. With the surprisingly useful Reverse delay, you’ll have a nice smooth sound. Such a broad range of delay types ensure that you never feel like the Flashback X4 is missing something. As more features get incorporated on pedals, they typically become more complicated. The more presets, effects, and footswitches available on some pedals make it quite fiddly. Fortunately, the X4 is pretty straightforward. Just turn the far-left knob to choose the delay type or to select a Tone-Print. Take advantage of the three middle knobs to control the parameters: delay time, delay level, and feedback. So far so simple, but it gets even better. Hold down one of the 3 main footswitches to keep a delay setting for future use. The looper works superb, thanks to the four footswitches. Each footswitch’s function is well labeled and easy to see. The large chunky knobs feel pretty secure. The large size ensures that it won’t flip over or roll around by accidentally tugging a cable, not the craziest benefit but still something to mention.. The pedal is conveniently rugged and will last a long time. 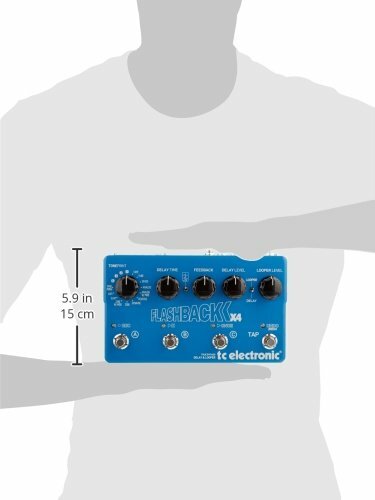 The Flashback X4 Delay Pedal has been around for quite a while. It has already built up an excellent reputation for being an incredible delay pedal. We confirm that it’s a good model and a favorite choice if you’re seeking a pedal which will offer you an extensive range of useful features. If you enjoyed our review of the Flashback X4, please also take a look at our tremolo pedals guide here.